From March 29 to 30, 2018, the Volvo International Service Training Award (VISTA) competition, hosted by Volvo (China) and organized by Car-O-Liner Academy, was successfully held in Car-O-Liner Academy’s training center in Shanghai. A total of 55 participants from 20 Volvo dealerships across the country participated in the competition. 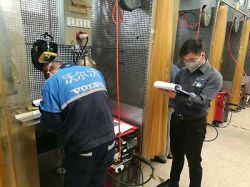 The event covered a variety of items, including vehicle body measurement and alignment, welding, bonding and riveting, SA service reception, vehicle inspection, spare parts storage inquiry etc. Over the course of two days, fierce competitions took place. All participants showed their capabilities and exhibited their high-level specialist skills to full extent. Car-O-Liner, as a long-term strategic partner of Volvo Group, has maintained sound partnership with Volvo in terms of technical exchanges and support, as well as project cooperation. Over the years, Car-O-Liner Academy has undertaken various events commissioned by Volvo, such as Volvo’s after-sales collision repair technique training and competitions. For this event, the Academy provided venues, equipment, personnel and security guarantees; it played a pivotal role in fostering a fair and equitable atmosphere for the competition and VolvoVistaCN_08.jpgenabled the event to be conducted smoothly. In addition, it also provided strong technical support for the competition by virtue of its rich experience accumulated from its wide range of collision repair training, assessment and competitions that have been commissioned by premium brands over the past years. The manager of Volvo Group’s training department expressed his recognition of the on-site work of Car-O-Liner Academy. He highly praised the technical proficiency of the staff and extended an optimistic attitude toward a future, long-term cooperation. The current collision repair industry is placing increasingly more focus on the repair quality and efficiency. It is undoubtedly an exciting phenomenon that Volvo Group can hold a sheet mental technique contest biennially. It has played an invaluable role in establishing recognized standards in the after-sales vehicle market concerning collision repair. The competition gives contestants the possibility to enhance their techniques and achieve self-improvement. At the same time, excellent participants that stand out in the competition can exert influence on coming generations of talents working in the collision repair industry, set up standards and provide an exemplary role for high-quality collision repair.